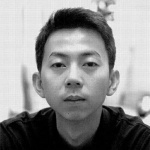 Tao Hui was born in Chongqing in 1987 and currently lives and works in Beijing. The video artworks of Tao Hui make art start to tell stories again. The narrative structures of films, TV shows and theatres incite him to create new ways of transmission of information and emotion. By the simple visual artistic form and a parallel way, Tao Hui’s works reflect the predicament and absurdity of society. In artwork “The dusk of Teheran”, a full-dressed Iranian girl says actor's lines from a Hong Kong singer. This artwork reflects the hard experience of all women who live in depressive society. The touching part of Tao Hui’s works is his interpretation of establishment of social structure and individual situation in the society by lyric and emotional way. By creating the interaction between different characters, he also presents particular culture and complexity of second and third-tier cities of China. We are full of hope for his future because of his particular literary imagination, narrative characteristics and visual expressivity.